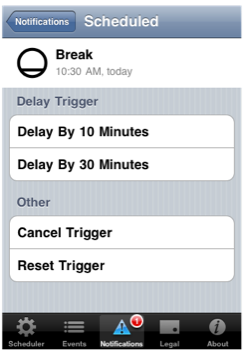 The Queued Trigger view appears when you tap on a queued trigger in either the Scheduler view or the Notifications view. Tap the Delay By 10 Minutes ( ) button. Tap the Delay By 30 Minutes ( ) button. Tap the Cancel Trigger ( ) button. A confirmation request will appear. Tap Cancel Trigger to confirm trigger the should be cancelled. Tap the Reset Trigger ( ) button. Tap Reset Trigger to confirm trigger the should be reset immediately.